This ADA approved, barrier free acrylic shower base with a left hand drain and built in accessibility ramp by Valley Acrylic is made of the highest quality high gloss acrylic. It is also the perfect option for anyone with mobility issues of any kind. All of Valley Acrylic's Signature Series products are manufactured in Mission, British Columbia, hence guaranteeing that these products are 100% made in Canada, and meets the excellent quality standards that are required by Canadian companies. A strong, easy-to-clean base for a beautiful shower. With its sleek lines and clean geometry, the 48" X 32" double threshold shower base creates a universal look that would be suitable in a variety of bathroom styles. All of Valleys Signature Series shower bases are manufactured in Mission, BC, guaranteeing a Canadian made product, manufactured to the highest standards of quality and design. This stylish and durable acrylic centre drain, single threshold shower base made for an alcove installation is a part of Valley Acrylic's Signature Series. This shower base is made of the highest quality high gloss acrylic. All of Valleys Signature Series products are manufactured in Mission, British Columbia, hence guaranteeing that these products are 100% made in Canada, and meets the excellent quality standards that are required by Canadian companies. 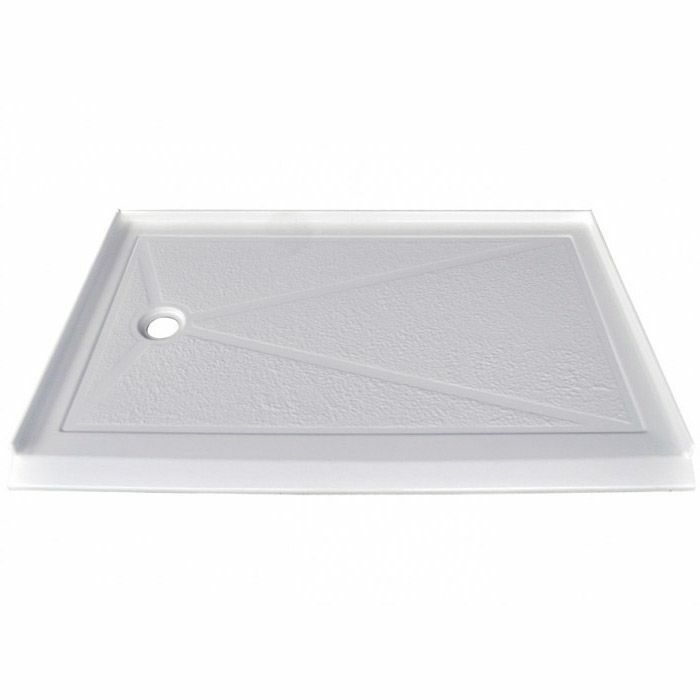 This stylish and durable acrylic offset drain shower base is part of Valleys Signature Series. This shower base is made of the highest quality high gloss acrylic and the drain can be positioned to the left or right. This shower base is very easy to install for home renovators who want to switch from a bathtub to a shower. All of Valleys Signature Series products are manufactured in Mission, British Columbia, hence guaranteeing that these products are 100% made in Canada, and meets the excellent quality standards that are required by Canadian companies. Serene 60x32 Left drain Barrier free Shower base This ADA approved, barrier free acrylic shower base with a left hand drain and built in accessibility ramp by Valley Acrylic is made of the highest quality high gloss acrylic. It is also the perfect option for anyone with mobility issues of any kind. All of Valley Acrylic's Signature Series products are manufactured in Mission, British Columbia, hence guaranteeing that these products are 100% made in Canada, and meets the excellent quality standards that are required by Canadian companies.